Joey rushes outside to get Mighty Mouse back, and see the cartoon hero stopping a purse snatcher, to the shock of both the victim and the many bystanders. And, of course, most of those bystanders are armed with smartphones which they use to take pictures of Mighty Mouse with (although, despite the character’s apparently pop culture popularity in this world, no one seems to recognize him). Realizing that this could get greatly out of hand, Joey has to convince Mighty Mouse to get away and come back inside before anyone figures out what’s really going on. That’s the gist of the plot, minus a surprising cliffhanger, which I will not spoil. But once again writer Sholly Fisch has given us a very fun story. I especially like a sequence where Joey has to warn Mighty Mouse about how to use his powers, as they will have different effects in the “real world” than in the cartoon world that Mighty Mouse comes from. At one point Mighty Mouse is about to punch a bad guy, but Joey stops him, pointing out that, even at his diminutive size, if Mighty Mouse were to punch a regular human with his full super strength, the man will probably be killed. 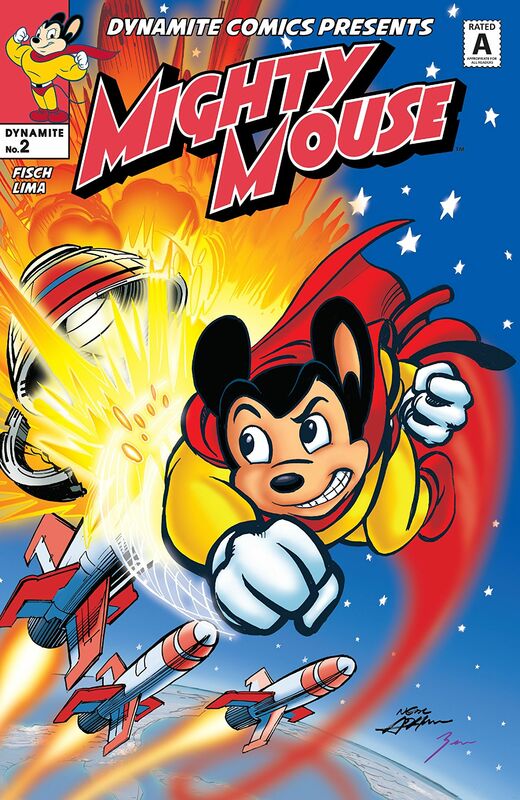 This is shocking to Mighty Mouse, who expected that his punch would simply cause the man to “fly through the air across the city, and land in jail – probably in one of those striped uniforms.” Because, yeah, that is the kind of thing that happened in those old Mighty Mouse cartoons.